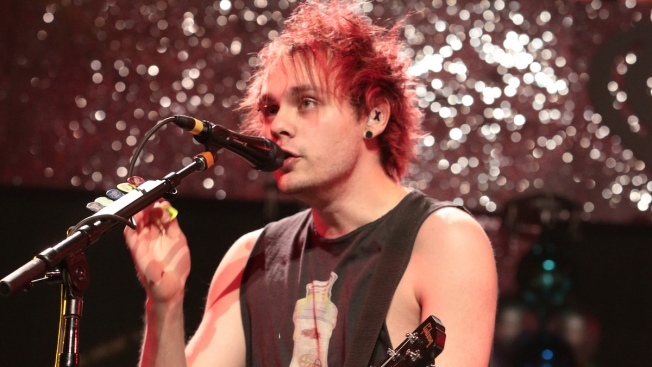 Guitarist Michael Clifford of 5 Seconds of Summer says he is fine after burning his face in an onstage pyrotechnic mishap. Fans saw the 19-year-old musician's hair catch fire when bursts of flame shot from the stage during the Australian band's concert at Wembley Arena on Saturday. Clifford was filmed quickly putting a towel to his smoke-engulfed head, before the concert was cut short. Clifford later tweeted a picture of his face half-covered in bandages with a message saying he was "doing OK."
Clifford returned to the stage in London Sunday for the final show of the band's European tour — without the pyrotechnics. The accident happened a day after Dave Grohl of Foo Fighters fell from the stage and broke his leg during a concert in Goteborg, Sweden.